To get to point where this calculation is relevant, there is a fair amount ground that needs to be covered. I am biased against investing in anything that doesn’t give a positive ROI within twelve months. Also, I am against inventing metrics to justify a marketing initiative. Calculating ROI in all marketing initiatives is crucial. With the increasing fixation on digital advertising especially social media, it’s even more important to track how these channels directly and indirectly contribute to revenue. Whatever analytics package you are using, there will be an assisted conversion report. This will give you an idea of how each channel affects revenue. Now, I know this is a simple approach. However, when you are talking to your boss who may not be well versed in the idea of attribution modeling, the simpler is better. The image below shows amount of conversions and revenue generated in 2015. As you can see Organic and Direct dominate with Email, Display, and Social at the bottom. 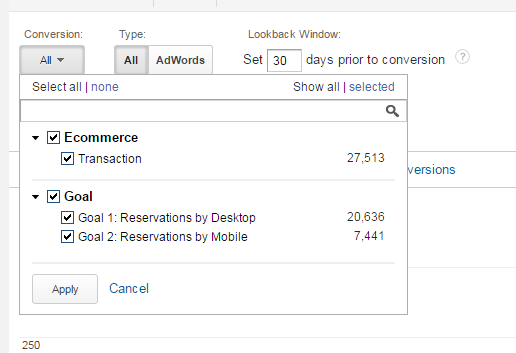 This can be found in Assisted Conversion Section of Google Analytics. Last Click Attribution is simplest way and most misleading way to measure ROI and the value of your marketing channels. This however is the the most common method of reporting .There is a lot more that goes into calculating true ROI. However, you might have to educate your boss on the buyers journey before diving into other metrics. Describing your buyers journey often helps you achieve this. The calculation on the far right is a ratio of Assisted versus Last Click or Direct Conversions. A ratio of 0 or below shows that the channels works primarily as final interaction channel. While 1 or more indicates that this is a multi-touch channel. Social Media is a multi-touch channel often acting as a point of action assurance, qualifier and even an introduction to a product or service. It is often difficult to see things listed in GA, so lets take it one step further and format things in a excel table for your boss. Here the top earning channels and the low performers. So, next question your boss will ask is where should the budget be spent in 2016. Judging by this dashboard, it should be in the the top 4 channels: organic, referral, direct and paid. Some managers only want to see returns on investments; So let’s break this down. According to Glassdoor, we would have to pay the following for high end Social media marketer. Total Social Media Revenue is $220,0521(Assisted + Direct) for the year. If we dig a bit farther into the data, we can blow our boss’s mind. Types of Conversions and Paths. Often Social media is a good way to drive a micro-conversion. For example a user downloads a brochure and converts later on. However, this can be difficult to track. Therefore it’s advisable to ensure that your have set up of PDF download tracking . An alternative is to use sing coupons and other tracking methods to collect the right amount of data for attribution. Micro conversions are usually measured as goals in Google Analytics. Therefore to show the types of conversion, you can find this under the conversions button in the the same Assisted Conversion report. Examples of goals can be anything that eventually leads to monetary conversion such as downloading a brochure, checking dates, calling to book etc. Often we assume the path to purchase is a direct one and in some cases this is true. The path to purchase is extremely complex and can expand over screens, time, devices and channels. Even looking at multiple session will not give you the whole story. However complex. it’s still incumbent on you to demonstrate to your boss your worth. Things can get very complex please evaluate the section below. I encourage to use these to explain the complexity of attribution to your boss. This not only makes your organization more data driven but also help to demonstrate all the work you’ve put into your social media initiatives.